The increasing vulnerability of infrastructure and human lives particularly in areas of the Megacities as well as the broad acceptance of sustainability as guiding principal for societal development is putting new emphasis on global processes and the associated geophysical variability and global change. In Earth system studies, the need for integrated data sets is increasingly obvious, both for observational studies of system processes and the validation of integrated system models. Though rapidly improving, the current scientific knowledge of the Earth system with respect to the main processes, the key indicators and the major forcing factors is still limited. Therefore, a more or less complete monitoring of the system’s state and trends is mandatory if a valuable contribution of global monitoring to environmental security and sustainability is to be expected. Thus, integrated global monitoring is a prerequisite for global environmental management of a sustainable Earth. Specialised global observing systems have already been initiated and partly are implemented (e.g. the G3OS, the Global Terrestrial, Climate and Ocean Observing Systems: GTOS, GCOS, GOOS). However, these systems are largely based on space-born remote sensing techniques, while investment in urgently needed in-situ measurements are smaller and often decreasing. Moreover, the integration of ground-based networks, data archiving and distributing facilities to provide integrated data sets of in-situ observations is still at its infancy. Space geodesy is now capable of monitoring variables of potential value for environmental monitoring systems. Moreover, in some of the existing networks, these techniques provide crucial auxiliary observations. 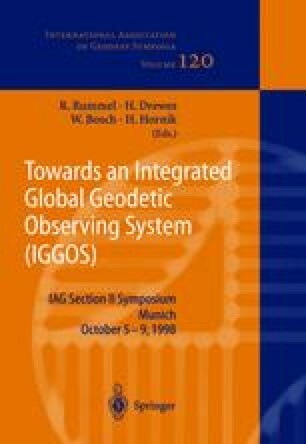 It is therefore of fundamental value to fully integrate geodetic monitoring techniques into a global integrated Earth monitoring system, which is a significant step towards an Earth information system for sustainability. This integration should follow the Global Integrated Observing Strategy.